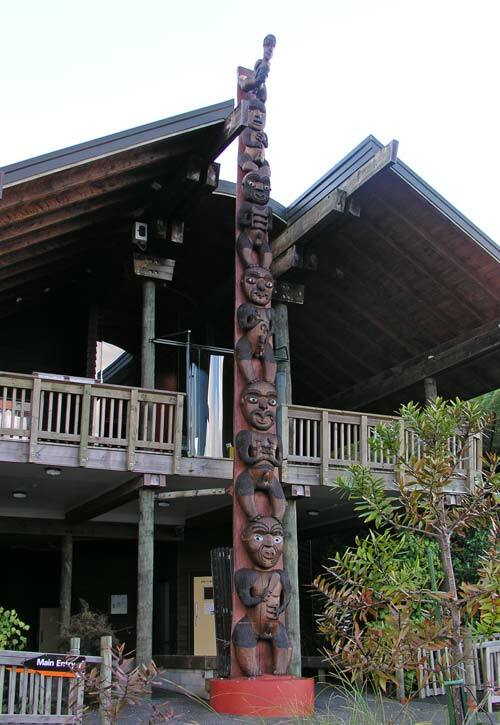 This carved post stands outside the visitor centre in the Waitakere Ranges, west of Auckland. It depicts some of the ancestors of local iwi Te Kawerau-a-Maki. The earliest ancestor, Tiriwā, appears at the top. Below him are Hape (senior priest on the Tainui canoe), Hoturoa (captain of the Tainui), Maki (a famous warrior), Te Kawerau-a-Maki (Maki’s son), and Te Hawiti (Maki’s great-grandson). This shows how direct blood lines (Maki and his descendants) can be found interwoven with earlier ancestors (Tiriwā, Hape and Hoturoa) within whakapapa.